Revive a Drain specialises in providing blocked drains and emergency plumber Melbourne services. Whether it’s a blocked toilet, leaking tap, burst water pipe, or you’ve just run out of hot water, call us today and we can be there within the hour. We don't charge call out fees because we know we can provide the best solution at reasonable prices. We're on call 24/7 and provide our customers with the same day service so we be there when need us most. We can unblock any clogged drain in Melbourne. And the majority of the time, we don't even have to dig! While you can never predict a plumbing emergency, our fully qualified team will be here to answer your call 24/7. Using the latest in drainage technology, our Melbourne plumbers can repairs your drains faster, cheaper & stronger. Running out of hot water too quickly? Or just sick of cold showers? Give us a call and we'll help you get your hot water back. Blocked & leaking toilets are a nuisance, especially, when they overflow. They can also significantly increase your water bill. For Fast Emergency Plumbers in Melbourne, Call Now! 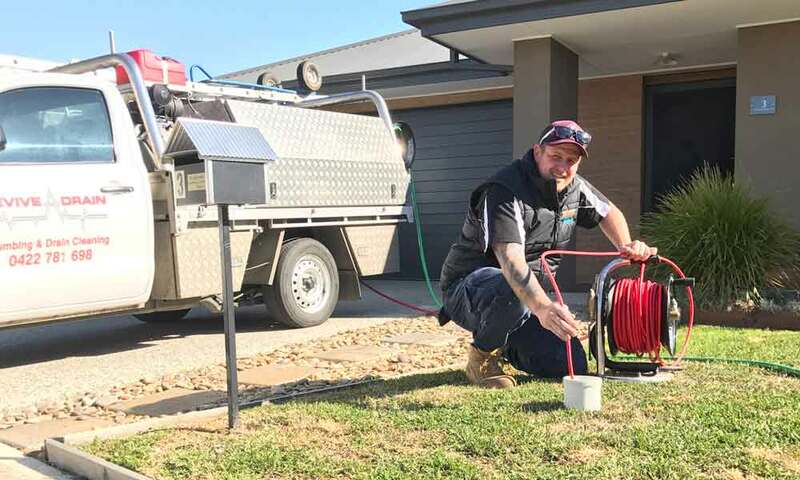 Revive A Drain is a family owned & operated plumbing company that has been providing Melbourne with world-class emergency plumbing and blocked drain services for over 10 years. Founded by master plumber & director, Aaron Robb, in the early 2000s, Revive a Drain quickly grew from a one man show into a full-service team because of their customer-centric focus and high-quality work. They now employ a highly qualified team of experienced emergency plumbers and provide Melbourne with round the clock 24/7 service. From general plumbing maintenance to the replacements of your hot water system, we can do it all. Call us today to book an appointment. Director Aaron Robb performing our famous blocked drain & drain relining services. Our customers have come to know us for our fast & reliable services. We’re sure you’ll come to know us for the following too! Always on time – you don’t have all day and we don’t either so we respect your time by always arriving on-time or 5 minutes early. Licensed Professionals – we only employ the best, highly qualified plumbers in Melbourne so we can deliver outstanding work. Friendly service – providing friendly service is important to us because we know it’s not always comfortable for our customers to have strangers in their home. Our customer service orientated approach was designed to change that so you’ll be delighted to have us back when you need us. Transparent pricing – unfortunately, dishonest billing practices can happen in our industry so we’ll let know exactly how much everything will cost BEFORE we do any work so you’re not hit with any nasty surprises. Satisfaction guaranteed – all our work is backed up with our risk-free 100% satisfaction guarantee. If you’re not happy with our work, we’ll keep coming back until you are! The fastest way to make a booking is by calling us on 1300 021 425. But if you’d prefer to book online, click the book online button below, fill out the inquiry form and we’ll get back to you as soon as possible.